A narrow passageway, both sides covered end to end in graffiti and tags. A bicycle part with handlebars is mounted just above the gate. The 360° view from the terrace atop Printemps department store is truly déli-cieux, which happens to be the name of the self-serve cafeteria here. 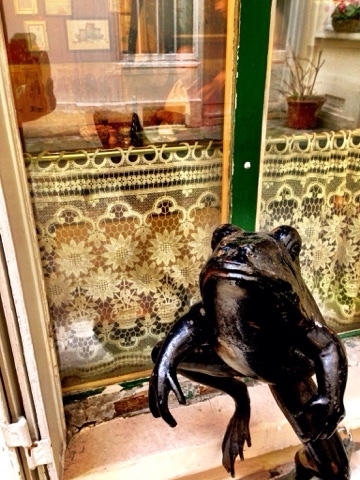 Detail from quirky Left Bank restaurant, Roger La Grenouille ("Roger The Frog"). Anyone who believes that frogs’ legs taste like chicken can decide here, where both are served. Inside, what appears to be a portrait is a man with a napkin tucked under his chin. With vacationers still away it's easy to find a quiet spot for a pique-nique in a city park, here, beneath a giant tree in Parc Monceau. Parasols, a quintessentially French fashion accessory from bygone days, prettily decorate the outside of a small shop just around the corner from the Picasso Museum. 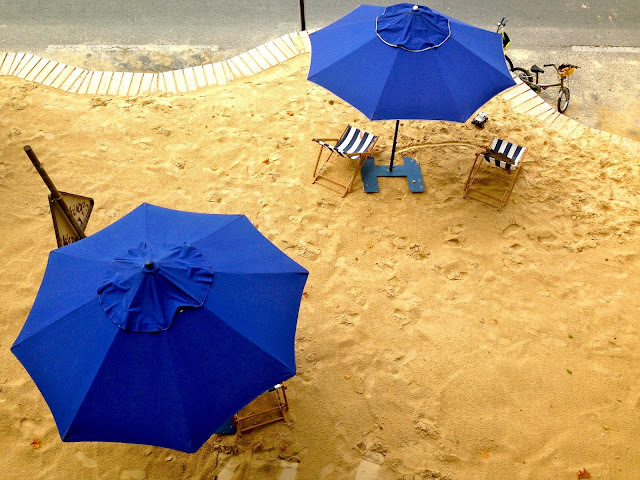 As August winds down so does Paris-Plages, the annual urban project that put a whole new spin on "stay-cation." Above, relaxing with free wifi and champagne. Members of a jazz trio take a break. Below, a small bar with potted palms has been set up as river boats cruise by in the background. 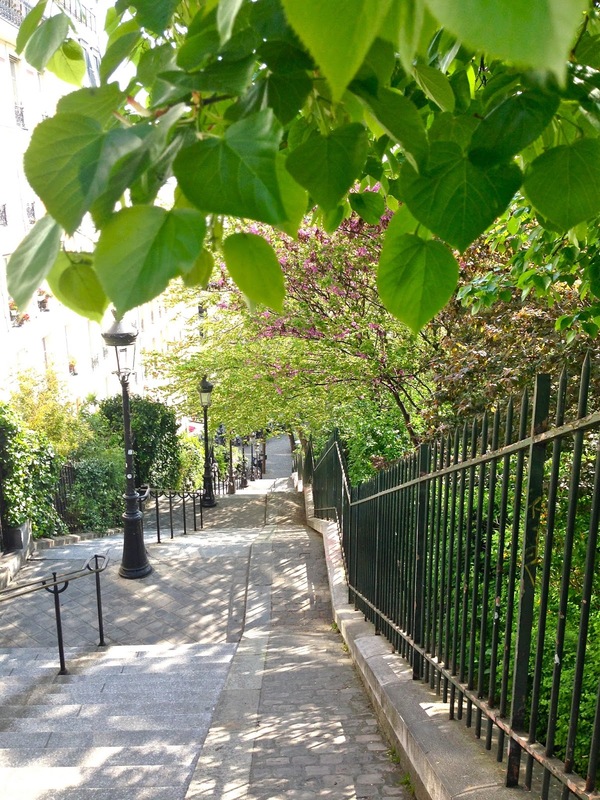 It's difficult not to run into an enchanting stairway at almost every turn in Montmartre. 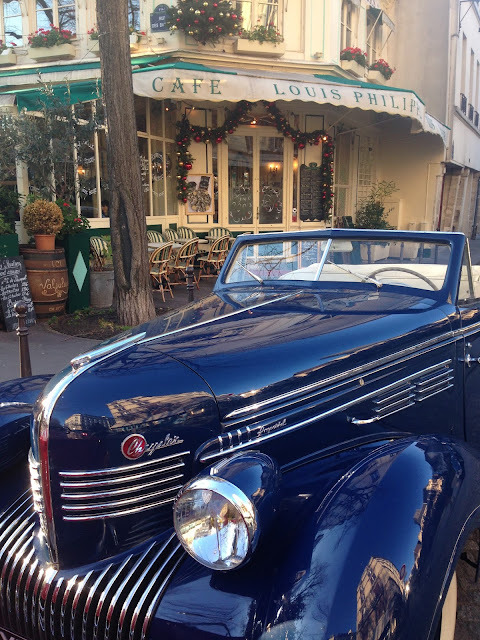 A vintage convertible parked outside a café near the Pont Marie invites visions of travel; of rolling vineyards, scarves flying in the wind and roadside champagne picnics. For August, volleyball courts were set up in the city center in front of the main Town Hall complete with sand, live music, palm trees, refreshments and changing tents, attracting swimsuit-clad players, some in speedos. 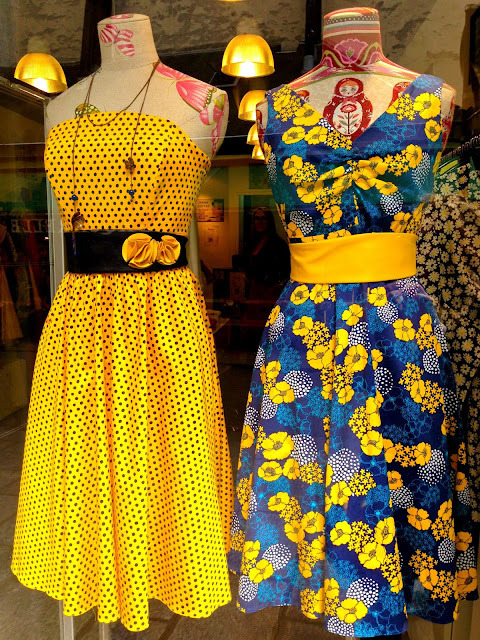 An earlier post last May, "Back to the dress," received so many views I thought I'd include these bright and airy day dresses as summer draws to a close. Two more. 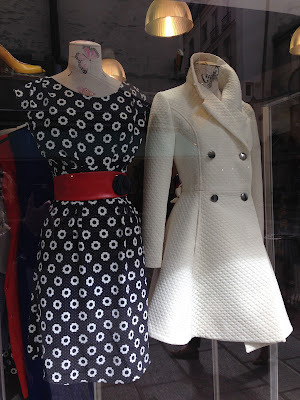 Some Paris dress boutiques like this one have on hand a selection of shoes specially made to match. Cool mornings, early to market. 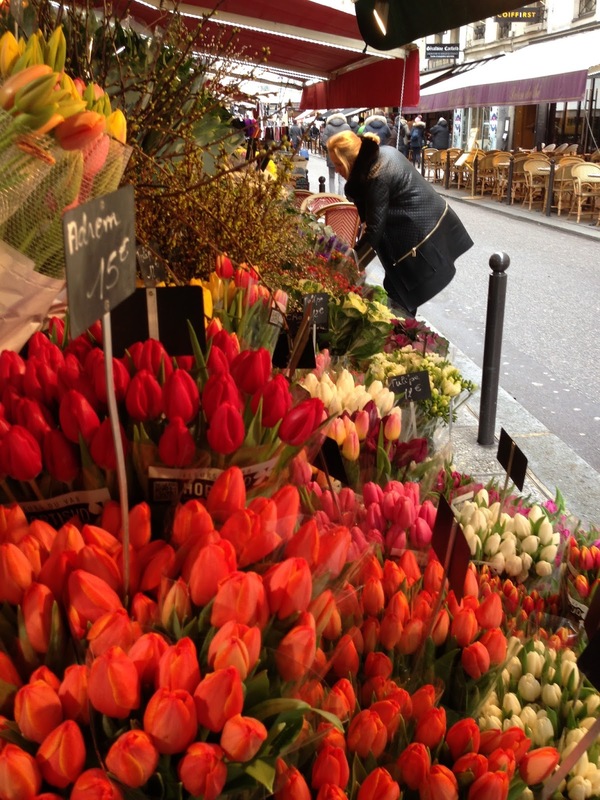 Whether it's street, roving or covered, in Paris - and all over France, even in the tiniest villages - there will be flowers for the table. Clock sculpture by French-born U.S. artist Armand Pierre Fernandez (1928-2005) aptly placed at Gare Saint-Lazare, a bustling travel hub. View of the Eiffel Tower from window looking onto train tracks and a footbridge. A rare sight in August, a sign that reads, "Open all summer." Besides breads this boulangerie has pastries, quiches and "sandwichs," all freshly made daily on their premises. Ever since my brother in Washington D.C.'s wedding reception years ago I've been on the lookout for the perfect quiche canapés. These are probably as close as I'll ever get. Detail from underneath blue section of Othoniel's métro entrance sculpture. A side view. The artist, Jean-Michel Othoniel, works with Murano glass from Venice. His fountain installations can be seen at the Palace of Versailles. Behind a kiosk near the Louvre a multi-colored art construction that serves as a métro entrance sparkles in the morning light. As you descend, even more colored glass decorates the walls inside. 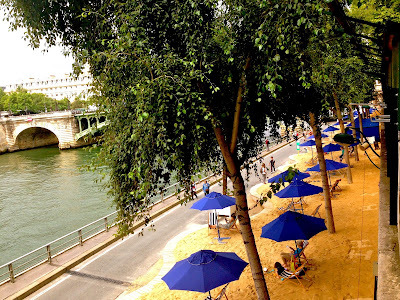 A view from the banks of the river made possible because traffic was diverted for the annual "beach" scene, Paris-Plages. 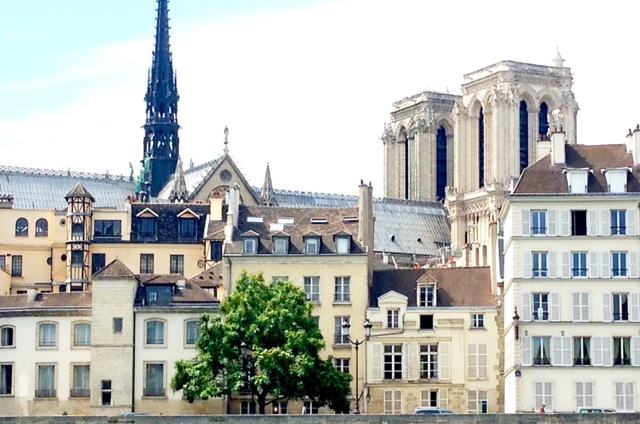 On the right, Notre-Dame Cathedral's towers. A café on Place Colette, named after the writer who lived nearby, ready for its first customers of the day. Once again Fashion Week will descend on Paris in September with endless parties, poseurs and Pretty People. Here, luxury bag brand Louis Vuitton struts samples from its shoe collection. That's right. Shoes. Recently I found myself dining at L’Ambroisie, a gastronomic jewel I'd written up for USA Today that sits at the top of many a foodie’s Bucket List. Helmed by mega chefs Bernard and Mathieu Pacaud, it's been called "the star among the Michelin three stars." Here's the review: “So who did Bill Clinton know to get a table at this Michelin 3-star during a State visit? If you can get a reservation here – gear up to start trying months in advance – consider yourself one of the world’s chosen few. Their awe-inspiring offerings are conversation stoppers, from the tiniest ameuse-geule morsels to reverie-inducing main courses. Small and discreet, L’Ambroisie is nestled under the arches of the Place des Vosges. Expectedly, very expensive.” Years later, little has changed. 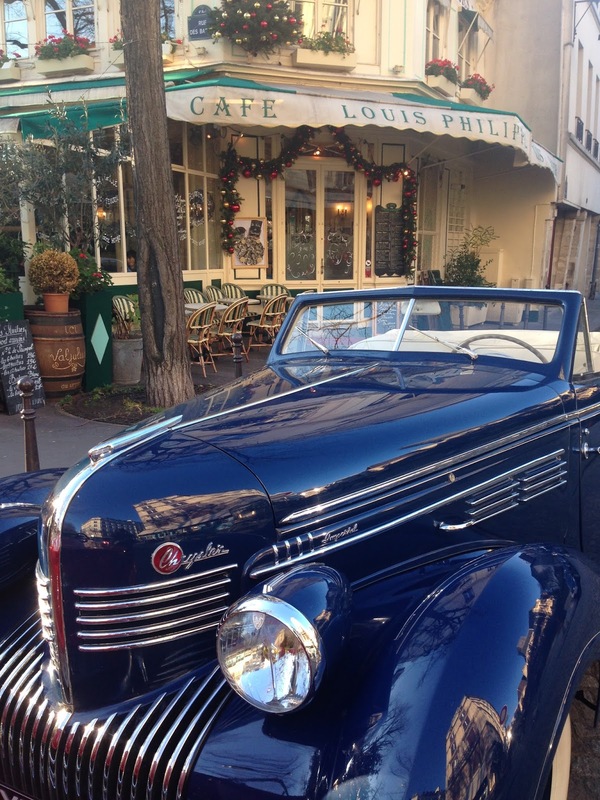 Classical French cuisine never goes out of style. We decided to just go for it and ordered a variety of courses, all the way to dessert. 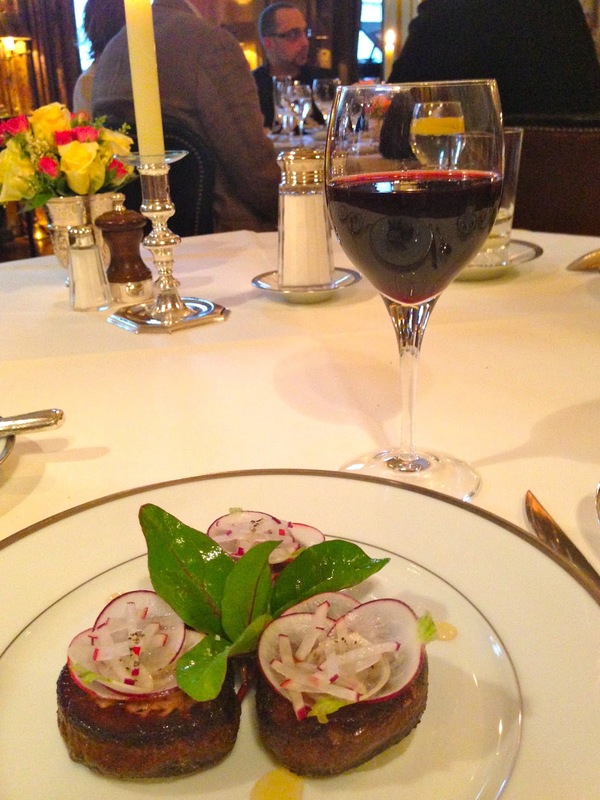 Above, melt-in-the-mouth caramelized medallions of foie gras de canard with a radish-turnip garnish. Escalopines de bar à l’émincé d’artichaut, caviar golden.... "Sea bass with minced artichoke and caviar" is an inadequate description: fish so fresh you’d think it was caught minutes before. Bursting with flavor poulet from Bresse smothered in its own jus and tiny wild mushrooms. Noisettes d’agneau de Lozère poëlées au beurre de sarriette, pommes "boulangères".... Fork tender lamb with a natural crunchy crust. Below, a selection of aged farm cheeses being cut to order. It's early at Place de l'Hôtel-de-Ville, and the only sounds as the city awakens are from this sparkly fountain. As much as the internet and TV have become main sources for news, for me, nothing compares to getting installed at a café on a market street with the morning papers. In Paris, getting away in August is considered so essential that each year the city sets aside a sizable budget to create Paris-Plages along the banks of the Seine, a bogus but fun "beach" set up for those who stay behind. 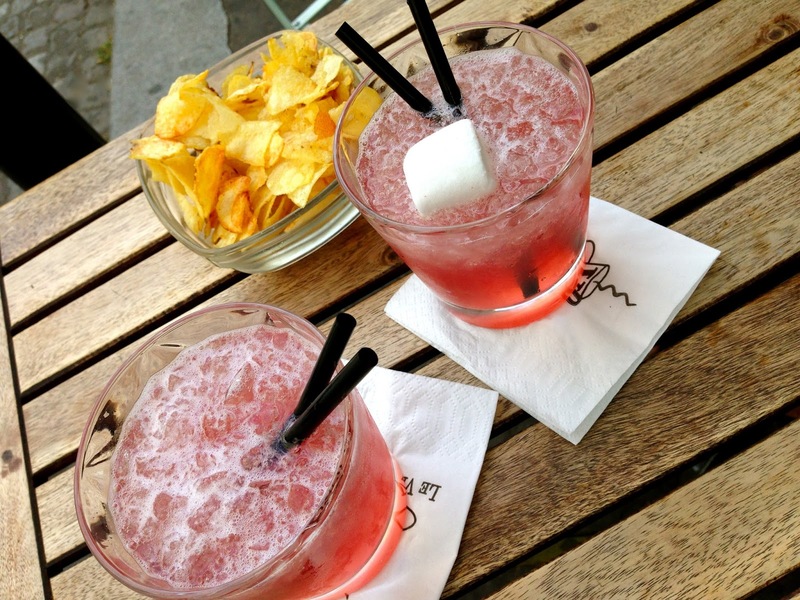 Le Vrai Paris, a popular Happy Hour café on rue des Abbesses, tops off its cocktails with a marshmallow. A secluded corner on the Île Saint-Louis overlooks quais of the Seine, the river, bridges, and Right Bank beyond.